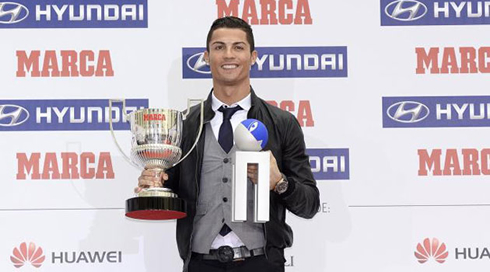 ﻿ Cristiano Ronaldo: "I will never get tired of winning"
10.11.2014 » Cristiano Ronaldo: "I will never get tired of winning"
This Monday, Cristiano Ronaldo has received the "Pichichi" award for finishing as the top goalscorer in La Liga last season with 31 goals, as well as the "Alfredo Di Stéfano" award, which acknowledged him as the best player in the Spanish League in 2013-14. 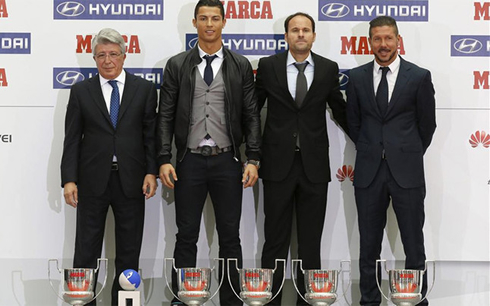 The Spanish sports newspaper MARCA has hosted its annual awards gala earlier this Monday, in a ceremony where Cristiano Ronaldo was given the honor to receive two important trophies concerning last season. 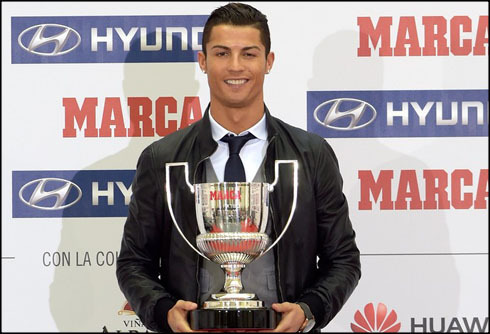 The Portuguese star was handed the "Pichichi" and "Di Stéfano" awards, the first one for having finished last year's league campaign as the top scorer with 31 goals, and the second one for having been rated the best player in La Liga also in 2013-14. These trophies are even more significant if we have in mind that Real Madrid finished 3rd in the league, behind Atletico Madrid and Barcelona. During the ceremony, Ronaldo gave a few statements to the press in order to mark the occasion and assured everyone that he won't be losing his hunger and drive for keep winning more trophies in the future. Real Madrid's honorary president, Alfredo Di Stéfano, passed away last July during a period where the final stages of the 2014 FIFA World Cup were still being played in Brazil. His memory will endure in the hearts and minds of many football enthusiasts and obviously, it won't be any different when it comes to the Portuguese star, Cristiano Ronaldo. Ronaldo: "I want to take this chance to start by saying that it's a real shame that we're not able to see Alfredo Di Stéfano handing me this award this year. I've seen many videos of him playing and what I can say is that he was a true phenomenon. It's been a real honor to have had the privilege to know him as I've did and he always motivated me to work even harder to improve my game. Since the day I met him when I arrived to Real Madrid, he has always been exceptional for me", started by noting the Merengues footballer, as he remembered Di Stéfano's great personality while receiving the award meant to distinguishe the best player in La Liga and that got named after him. Cristiano Ronaldo: "I would be delighted if I could repeat what I've done last year, since that would mean I've done things right. My goal is to keep winning trophies for my team, as well as individual awards. I work really hard to accomplish that and if I end up being called again to this ceremony next year, it will surely be a good sign that things may have gone our way", stated the Real Madrid forward, who recently also received the Golden Shoe award, after having become the top goalscorer from all European domestic leagues last season. When Ronaldo got asked if he thinks he will be able to keep this level in the future, as well as being as determined and motivated as he's always been until now, his answer was pretty categorical. Cristiano Ronaldo: "Everyone has their own way of thinking and working. Playing football is what I like the most and I always try to give my best. I will never get tired of winning! ", convincingly affirmed the 29-year old superstar, who is currently rated the main favorite to win the upcoming FIFA Ballon d'Or 2014 trophy, which in case of happening, will be the third of this kind in his footballer career. Ronaldo: "I might indeed be going through the best form in my career until now, but I always try to do better than what I've done in the previous year. I'm well aware that this won't be possible to achieve for much longer though, but I'm really hopeful about being able to continue winning great things in the future. I'm very happy and the team is playing really well. We're improving day after day and I don't think I'm doing bad when it comes to contribute with assists and goals. I just want to keep learning and getting better", concluded the Portuguese player. Cristiano Ronaldo next game will be for the Portuguese National Team in a qualifier for the EURO 2016 against Armenia, scheduled for next Friday, the 14th of November. You can watch Juventus live stream, Portugal vs Armenia, Netherlands vs Mexico, Turkey vs Brazil, Argentina vs Croatia, and Germany vs Gibraltar, all matches provided from our live football streaming game pages.